The most famous images of London on the big screen are fragmentary, illusory even: the blue door of Notting Hill (1999), Newman Passage at the beginning of Michael Powell's Peeping Tom (1960), the Bank of England in Mary Poppins (1964), or the rooftop sets from the same film. This may be because we have very little interaction with the capital's best-known icons in our day-to-day life, unlike the Disney-fied characters in the live-action version of 101 Dalmations (1996), say. The capital's streets don't always offer the best views of landmarks - unlike Paris - and, as amateur photographers know, it's difficult to capture the bustle of crowds on camera. My favourite depiction of London's streets and buildings comes in the Boulting brothers' Seven Days to Noon (1950), when the city has to be evacuated after a scientist threatens to detonate a bomb if the government doesn't halt nuclear research. 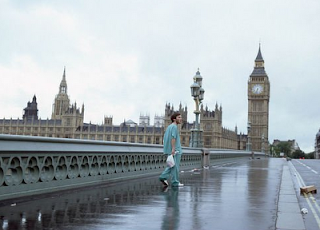 It may well have served as inspiration for the deserted scenes in Danny Boyle's zombie thriller 28 Days Later... 52 years later: compare the shot from 28 Days, top, with the - very small, sorry - image from Seven Days, below. While these two films show off London's landmarks to best effect they also capture Londoners' psyche: in such metropolitan Hollywood disaster movies as Independence Day (1996) and The Day After Tomorrow (2004) people are shown coming together in the face of apocalypse. We, on the other hand, want nothing less than the city to ourselves.